Melilla, North Africa. October 2005. It was after darkness had fallen that the migrants came running towards the Spanish enclaves of Ceuta and Melilla. Hundreds of road-weary Africans descended from their Moroccan forest encampments, threw makeshift ladders onto the border fences circling the territories, and scrambled to climb across. Silhouetted figures crowded in between the fences, cameras capturing their blurry movements between reams of barbed wire. Journalists called it el asalto masivo, the massive assault: newscasts and front pages showed the black migrants, many “violent” or “desperate,” advancing swiftly and silently. Then Moroccan or Spanish security forces—it was never clear who was responsible—fired into the crowds. At least fourteen people died. The ramshackle migrant encampments outside the enclaves were razed and burned by Moroccan soldiers; their inhabitants were rounded up, detained, and put on buses bound for the faraway Sahara. Many were never heard from again. Then controls tightened, the border was cleaned up, the media moved on. But soon a new front would open up in Europe’s “fight against illegal migration”: the sea route to the distant, improbable destination of the Spanish Canary Islands, where in 2006 more than thirty thousand boat migrants landed among sunbathers, Red Cross volunteers, and throngs of journalists and police. After years of increasing migrant arrivals on southern European shores, the chaos at Europe’s external borders had begun in earnest. Lampedusa, Italy. March 2011. The tragedy happened at the time of the Libyan uprising. An increasingly desperate Colonel Gaddafi had promised to unleash an “unprecedented wave of illegal immigration” on southern Europe as a riposte against impending NATO attacks. Soon African refugees set out, boatload after boatload, their blank faces filmed by the BBC, Al Jazeera, and CNN as their rusting, creaking, or leaking vessels approached the Italian island of Lampedusa with its waiting crowds of aid workers, journalists, and police. The spectacle of boat migration was routine by now, European audiences hardened and blasé—and so, it turned out, were the coastguards and soldiers. The tragedy—one among many—began when a dinghy set sail from Tripoli with seventy-two passengers onboard. Its distress calls went unheeded. A military helicopter air-dropped water and food and then disappeared, never to return; the boat drifted for two weeks through NATO’s maritime military zone before washing up on Libyan shores. By then all but nine of those onboard had died of thirst or starvation. The tragedy was a “dark day for Europe,” concluded an official investigation. Yet migrants keep waking up to new dark days at Europe’s southernmost fringes—whether outside Lampedusa, where hundreds drowned as their boats capsized in autumn 2013; in the treacherous riverbed of the Greek-Turkish border; outside Ceuta and Melilla; or in the straits of Gibraltar and Sicily. Barely a decade after the debacle at the Spanish fences, the border now promises constant chaos. Gruesome tales of migrant deaths abound at the gates of the West, whether at the southern frontiers of Europe, at the U.S.-Mexican border, or along Australia’s Pacific shores. The scenes of this story are familiar: “illegal immigrants” crammed into unseaworthy boats, squeezed into rusty trucks trundling across the Sahara, walking through the distant deserts of Arizona, or clinging onto Mexican cargo trains. Thousands have perished on these grueling treks, with one incomplete tally listing almost twenty thousand deaths at the gates of “Fortress Europe” since 1988. Yet the misery does not end there for today’s migrant outcasts. The media, populist politicians, and zealous bureaucrats have seized upon the illegal immigrant as a bogeyman, a perennial outsider who in waves and floods invades Western countries. In their accounts, a global pariah is emerging: alternately an object of deep fascination and utter indifference, of horror and pity, he stalks the borders of the rich world, sowing panic, wrecking election campaigns, and generating headlines as he goes. Much has been written about this “threat” lurking outside the gates: news reports, documentaries, policy papers, academic tracts, and funding reports in which the irregular migrant is followed, scrutinized, probed. This book takes a different approach. It casts an eye on the observers and investigates the workings of what I will call an illegal migration industry—or “illegality industry” for short—in the emerging Euro-African borderlands. It moves across the domains in which this industry works on its captive human material: from the control rooms of Europe’s new border regime and the shelters where humanitarians care for migrants under the watchful eye of the state to the police patrols scouring African terrains for a sighting of their elusive prey. This cannot be done, however, without considering the target of these interventions—the irregular migrants and, in particular, the sub-Saharan travelers among them who increasingly find themselves marooned in the no-man’s-lands springing up like weeds in the interstices between Europe and Africa. Running the gauntlet of border controls that now stretch across deserts and high seas, North African cities and dusty Sahelian dumps, these travelers are subject to what the director of a Spanish migrant reception center called a Darwinian selection. It is a selection of the most brutal kind, in which shriveled bodies disappear in Saharan dunes and bloated corpses float ashore at the Strait of Gibraltar. Luckier travelers get stuck in newly cosmopolitan border towns and fringe neighborhoods of Tangier and Oujda, Tripoli and Tamanrasset. Others get deported, time and again. Yet whether they succeed or fall short of their goals, these travelers increasingly end up collaborating in their own making as illegal immigrants on the infernal production line of the illegality industry. This book is an ethnography of the industry’s operations along the western edge of Europe’s external border: between West Africa, the Maghreb, and Spain. In these emerging borderlands, the coming chapters will show, the European response to “illegal” African migration has sparked conflicts and contradictions that speak volumes about rich countries’ relations with their southern neighbors. Only rarely does the story touch down on European soil; for the business of bordering Europe now thrives well beyond the confines of the continent’s geographical borders. Visit the publisher’s website for a sample chapter. The online appendix to Illegality, Inc., ‘A global front: Thoughts on enforcement at the rich world’s borders’, can be downloaded as a pdf here. Illegality, Inc. is available via many online outlets, including Wordery, Amazon, the Guardian Bookshop, Blackwell’s (UK) and AbeBooks. The book can be purchased with a 30% discount using promotion code 15M4426 at the publisher’s site above (US only). Listen to the BBC podcast about the book or watch an interactive BBC video (video only available in the UK). 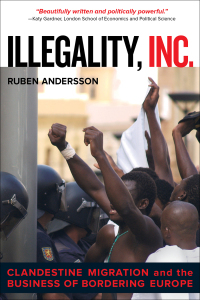 Illegality, Inc. was chosen as book of the year by the UK Migrants’ Rights Network. Recent reviews include: Africa; Social Anthropology/Anthropologie Sociale; Crimmigration; British Journal of Criminology; Allegra Anthropology Lab; Oxford Border Criminologies; Council for European Studies; Migration Studies; Africa@LSE; Gazeta de Antropología (Spanish); Social & Legal Studies; Critical Criminology; Global Justice; Movements journal; and Politique Africaine (French). Media interviews include CNN; BBC Scotland; BBC World Service; Time magazine; NPR Morning Edition; Libération (France); Público (Portugal); Deutsche Welle (Germany/Spain); eldiario.es (Spain); SVT and Dagens Nyheter (Sweden); P1 Konflikt (Sweden); Information (Denmark); Migrants’ Files reports in Swedish (Sydsvenskan) and Spanish (El Confidencial); and CQ Researcher. Comment pieces, articles and reports on the topic of the book can be found under Publications on this site.